Hiking is a great outdoor activity that helps you exercise, enjoy nature, and spend time with friends. The Hiking Items Checklist Template goes over multiple items for beginner, intermediate, and advanced hikers. Read on for tips on hiking. If you are just starting to hike, make sure you take it easy and start off with a trip that is only one or two hours long and is close to home. Always take at least one other person with you in case of an emergency. Wear shoes that you have broken in and are sturdy and strong against rocks and other jagged items on trails. Make sure to bring sunscreen, water, a map, and any medication you regularly need. If you are hiking in the evening, bring a flashlight and a communicator for you and your friend. Always carry a card on you that has your information and a contact to call in case of an emergency. If you are ready to go on longer hikes or tackle more difficult trails, you will need a few more precautionary items. Along with what was listed before, pack a small bag with a first-aid kit, extra batteries, and items to help you navigate like a GPS. If you are an advanced hiker, you will likely be going on long hikes and need to bring a bag with you. Familiarize yourself with the area by studying and bringing a map, and know what insects, reptiles, and wildlife you may encounter. A first aid kit should contain the basics such as gauze and disinfectant, along with anything that would help you in case you come in contact with a snake or cave of bears. Check the weather forecast before leaving, but bring a raincoat or extra sweater just in case. 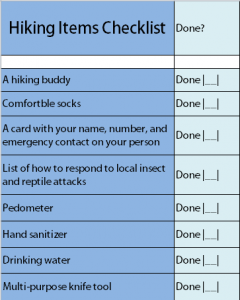 Download the Hiking Items Checklist Template.